Here are two Canadian painters, Jennifer Walton and Marcel Guldemond, who have turned their great talent and sensibilities toward the subject of hockey. The result is both beautiful and striking. I’m particularly impressed by how their work marries nature and hockey. Scramble, oil on plywood, 2010, by Marcel Guldemond. 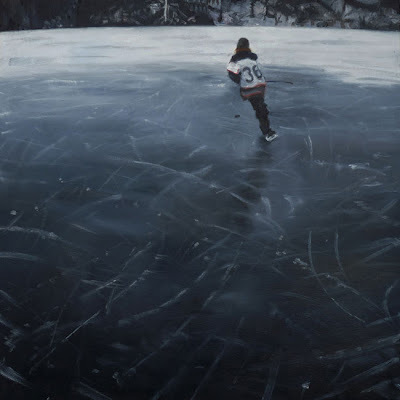 Black Ice 2, oil on canvas, 2011, by Jennifer Walton. The New York Times says, "Puckbite is a mess of self-indulgent, melancholic absurdity. Absolutely loved it!" Midlife Hockey Crisis says, "If Tom Wolfe and Kurt Vonnegut did peyote and penned a blog together while wearing hockey skates, it would resemble Puckbite. Proceed at your own cranial risk." Captain CanAmerica says, "Far-out and funny, Puckbite engages readers with his enthusiasm, eccentricity and authenticity. He captures the joie de vivre of exploration and is a joy to read – from either side of the 49th parallel." Give to help kids play and grow. I live in Montreal. My main website is artplouffe.com. I’ve always enjoyed watching ice hockey, but I only learned to skate at 19. Until I began seriously perfecting my skating in 2007, hockey seemed inaccessible and daunting, like a sport reserved for the gods or mortals with divine approval. Then I bought myself a stick and another for my eldest son, who was 5 at the time. I was 49. We played and I was surprised how much I got into it. Hockey for me is fascinating, high-speed geometry you feel in your gut and etch with your body as well as with extensions like sticks and skates. Hockey is colorful sweaters and cool gear. It’s echoing pucks, sharp blue skies and chill that stings your nose. There’s camaraderie, too. I’m kind of a quirky guy, so this website is a way for me to get the weird and the beautiful out while paying tribute to the sport I love and to those who, like me, pick it up late in life. 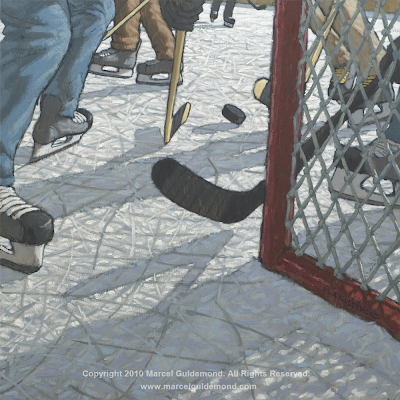 Visually, my work explores the harmony and tensions between nature, the human form and ice hockey. The pieces consider hockey as human expression within the context, possibilities and confines of nature. The body appears both triumphant and frail. Copyright Jean-Pierre Plouffe. Simple theme. Powered by Blogger.